Are you looking for unspoiled scenery, lovely villages, historical towns and naturebased activities? Then look no further. The northern fjord region of Norway is a landscape full of contrasts with fascinating coastal towns - Ålesund, Molde and Kristiansund, and an archipelago of tiny islands and fishing communities. Inland the dramatic Sunnmore Alps, Sunndalsfjella mountains and fjords cannot fail to impress. Staggering mountain peaks, thundering waterfalls, vibrant green fields, and attractive hillside communities unite to create one of the most spectacular landscapes in the world. On arrival at Ålesund airport, transfer to the Brosundet Hotel. Overnight at the Brosundet Hotel, The Fjords and Trondelag. Free time in Ålesund. 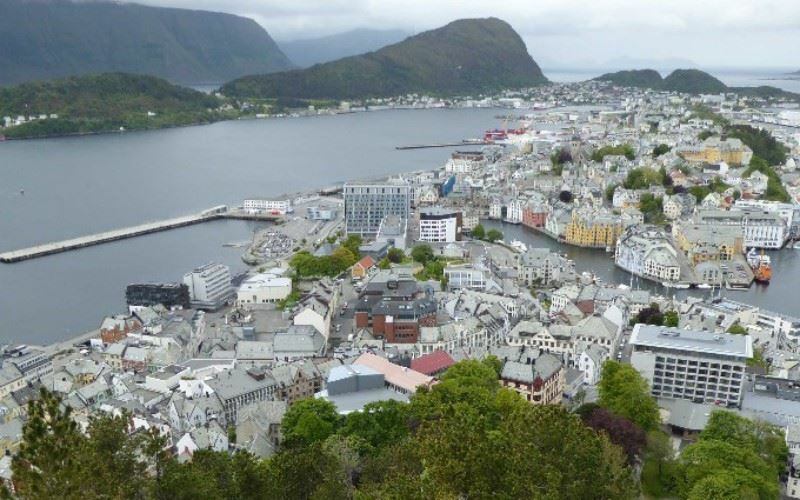 Famed for its Art Nouveau architecture, Ålesund is a picturesque town with much to offer visitors. Whether you are searching for a cultural escape; gastronomic break; or a base from which to explore the fjords and the Norwegian Sea coastline, Ålesund is for you. Rebuilt in 1904, after a fire destroyed the town, the historical centre of Ålesund has a distinctive architectural style. At every turn a multitude of towers, spires, ornamental facades, and colourful buildings catch your eye. In the evening a choice of restaurants, cafés, and bars are at your disposal. Alesund is the largest export port for Klipfish and Norwegian cod and as such, you will find the ‘catch of the day’ served in most restaurants. The Maki restaurant at the Brosundet Hotel is considered one of the best fish restaurants in Alesund. Ålesund’s natural backdrop is breathtaking. Stretching along the Norwegian Sea coastline, a mountainous archipelago awaits exploration. This is the home to the island of Runde, the site of largest bird cliffs in Norway, the quaint fishing community of Alnes and is a destination for nature lovers, hikers, artists and outdoor enthusiasts – kayak tours, rib boat safaris; fishing trips are all available locally. Today, drive from Ålesund to Geiranger, the jewel in the crown of Fjord Norway’s scenic gems and on the ‘must see’ list for most visitors. We would recommend that you ‘make a day’ of your journey, taking the longer route to Hellesylt and then cruising to the end of the fjord, and your destination, on board a car ferry. The cruise along the Geirangerfjord is leisurely and peaceful – find a space on deck or in the panoramic lounge and watch the world go by. The ‘Batchelor’ and ‘Seven Sisters’ waterfalls that cascade down the mountainside in the Geirangerfjord offer excellent photographic opportunities. Overnight at the Union Hotel, The Fjords and Trondelag. Day at leisure surrounded by the majestic natural environment of the fjords. Take a short hike; visit the panoramic viewpoints of the region; hire a kayak; participate in a rib boat tour; or visit the Nowegian Fjordcentre (payable locally) - the choice is yours. After breakfast, leave Geiranger on the Eagles Road - a scenic road which affords wonderful views down the mountainside and along the fjord back to the village of Geiranger. This is not the only panoramic road that your journey to Angvik, in the north of the fjord region, will take today. You will also enjoy a drive on the Trollstigen Road, a National Tourist Route of 11 hairpin bends (summer months only) before reaching the fjordside roads of the Langfjord. Overnight at the Angvik Gamle Handelssted, The Fjords and Trondelag. Day at leisure. Opportunity to enjoy and experience the Tingvollfjord, a quiet and lesser-explored part of the fjord region. Alternatively, drive to the Norwegian coastline and visit the towns of Molde and Kristiansund. After breakfast, drive to Ålesund airport for your return flight to the UK. Your journey to the airport could include a drive along the Atlantic Road. Named as one of the best road trips in the world, the Atlantic Road zigzags 8274m over 8 low bridges and islets between the fi shing village of Bud and the town of Kristiansund. Surrounded by meandering fjords, small fishing communities and majestic mountains, the Art Nouveau town of Ålesund is the ideal location for a short break, a base from which to explore the spectacular Sunnmøre coastline, or as part of a fly-drive holiday exploring the Fjord region. Surrounded by meandering fjords, small fishing communities and majestic mountains, the Art Nouveau town of Ålesund is the ideal location for a short break, a base from which to explore the spectacular Sunnmøre coastline, or as part of a fly-drive holiday exploring the Fjord region. Brosundet Hotel lies in the heart of the historic centre of Ålesund, surrounded by beautiful, individually designed Art Nouveau buildings and a myriad of turrets and spires. Originally built in 1906 as a warehouse for salted cod, this listed building has been tastefully remodelled and modernised to create a charming hotel of character. Attention to detail is apparent throughout from the individually decorated bedrooms to the excellent seafood restaurant and attentive service. Recommended. Safe deposit box available at reception. From Ålesund it is possible to visit the island of Runde – home to one of the largest bird sanctuaries in Northern Europe, with over 230 species, and explore the islands of Giske, Godøy and Valderøy or explore the Geirangerfjord or Hjorundfjord on a day excursion. Narrowing as it winds its way inland, passing waterfalls, abandoned farms perched on mountain ledges and imposing mountains, the Geirangerfjord finally comes to rest at the village of Geiranger. Narrowing as it winds its way inland, passing waterfalls, abandoned farms perched on mountain ledges and imposing peaks, the Geirangerfjord finally comes to rest at the village of Geiranger. A bustling harbour village during the summer months, Geiranger is often explored by day-trippers from one of the many cruise ships that sail the waterways. Despite the influx of tourists during the summer, the village, as well as the spectacular landscape and wealth of activities, warrants a longer stay. Affording superb views of the Geirangerfjord and enjoying a quiet location set back from the harbour front, the position of the Union Hotel, in our opinion, is unrivalled. There has been a hotel on this site since 1891, and since 1899 the residing hotel has been owner-managed by the Mjelva family. Today Monja and Sindre Mjelva, fourth generation owners, extend a warm welcome to their guests. Breathtaking views of the Geirangerfjord can be enjoyed from many of the hotel bedrooms, lounge and panoramic restaurant, and for those wishing to relax and unwind, a well-maintained garden, swimming pool and outdoor Jacuzzi pool complete the scene. Many rooms can accommodate two extra beds for children. At the top of Fjord Norway the Romsdal and Nordmøre regions offer a contrasting natural environment to explore. At the top of Fjord Norway the Romsdal and Nordmøre regions offer a contrasting natural environment to explore. Here you will find deep fjords and steep mountains sitting side-by-side with a chain of islands and charming coastal and rural communities. This is a tranquil and authentic destination, little-explored by foreign visitors. One hour’s drive inland from the historical town of Kristiansund is Angvik Gamle Handelssted, a classical hotel situated on the shores of the Tingvollfjord. Backed by a lush hillside and small fjord-side hamlet, the location is nothing short of idyllic. Inside the remodelled 16th century wharf, attention to detail is apparent throughout and the focus is on relaxation, personal service and delicious local produce. In addition to comfortable lounges and a refined candlelit restaurant, Angvik has an indoor swimming pool and sauna. Fjord views can be enjoyed from the pool, many guest rooms and from the outdoor terrace. Step back in time whilst enjoying all modern conveniences. All but four rooms have a fjord view. Motor boats available for hire c.200SEK per hour.